The side project journeyman is back at it! Everything Diplo seems to create turns right into gold. His latest project teamed together Labrinth, Sia, and himself to create the genre-warping group LSD. The unlikely trio first burst on the scene last May releasing successful singles ‘Genius‘, and ‘Audio‘ which set the stage for this unique experimental experience they want to take us on. 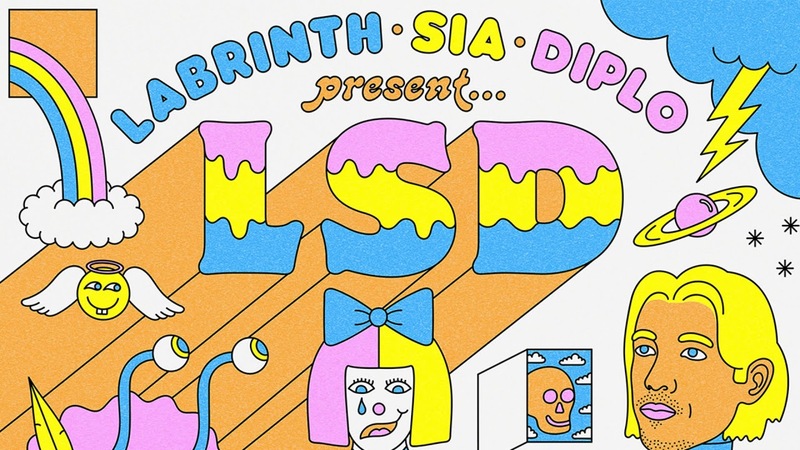 Out today (April 12th) self-titled album Labrinth, Sia & Diplo Present…LSD, this album is a drug in itself (no pills needed). LSD combines the beautiful voices of Sia and Labrinth over the incredibly unique melodies and beats that Diplo creates. The full album release, we see their very successful prior singles along with 3 brand new tracks ‘Angel in Your Eyes‘, ‘Heaven Can Wait‘, and ‘It’s Time‘ altogether as one. LSD set out to show the mind is an amazing creature and anything is possible. If you can dream it, it can become a reality. Let your mind free and check out Labrinth, Sia & Diplo Present…LSD below!